“Discothèque” was the first single released to promote the album “Pop” in 1997. The promotional singles were released to radio in January of 1997, ahead of schedule, due to an internet leak of the track. The commercial single followed in February 1997. In most cases the additional songs found on the release were remixes of the title track, and there was a number of these released. A single 7-inch promotional release was produced in France, for use throughout Europe. It was a juke box single and featured a molded injection label, rather than the usual paper label. This was released in a generic sleeve. It was backed with “Holy Joe (Garage Mix)”. There were 7-inch vinyl juke box singles released for Italy as well, but these were not a U2 specific release and featured a b-side by another artist so are covered elsewhere. A number of 12-inch promotional releases were distributed. The most complete was a three vinyl set, released in a silver sleeve. This was a USA issued promo. Inside the outer silver sleeve were three vinyl, each with a unique colour on the front of the inner sleeve, orange, blue and pink. The label on the vinyl matched the colour of the inner sleeve. The orange promo contained “DM Deep Extended Club Mix”, “DM Deep Beats Mix”, “DM TEC Radio Mix” and the “DM Deep Instrumental Mix”. The blue labeled vinyl contained the “5:08” version, as well as the “David Holmes Mix”. The pink labeled vinyl contains the “Howie B., Hairy B. Mix”, and the “Hexidecimal Mix”. In the UK this was released as a double vinyl (12ISD649DJ), which contained the orange and blue vinyl, but not the pink. The pink vinyl was released in the UK as a stand alone release, with a slightly different catalog number (12ISX649DJ). Finally in the USA there was a single disc 12-inch release, which was “Made in the USA” but “Printed in Canada”. This contained the “DM Deep Club Mix” and the “DM TEC Club Mix”. It was released in a picture sleeve. The vinyl itself was pressed in the USA for the USA market, but the outer sleeve was printed in Canada. Some copies of the commercial single were also circulated for the purpose of promotion. In the UK two 5-inch CD promotional releases were witnessed. The first of these was released under the catalog number DISCO1, and contained just the “Radio Edit”. It was released in a slimline jewel case with a full colour insert. 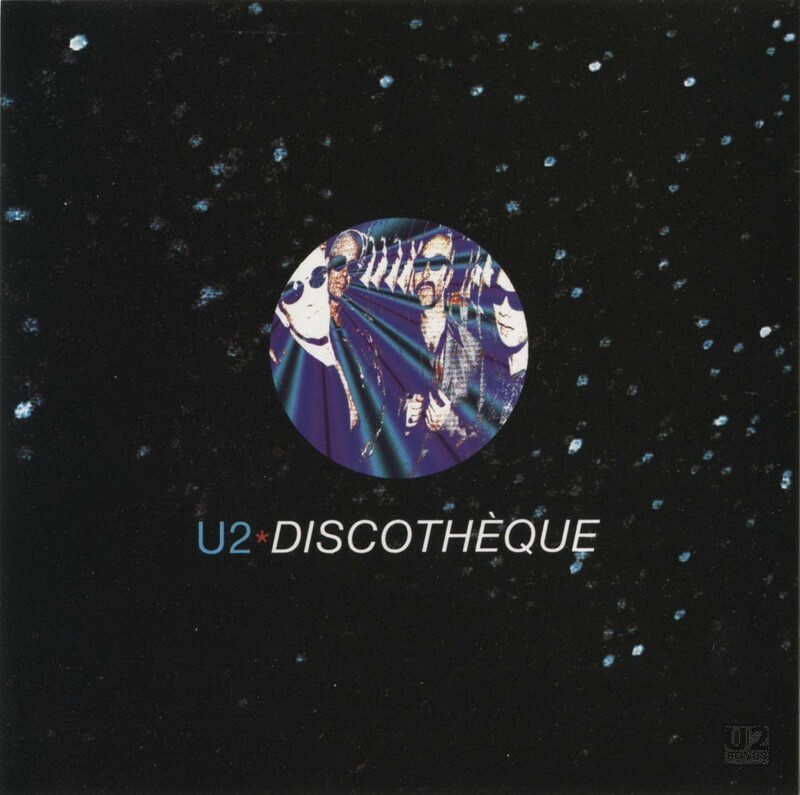 The second release was catalog number DISCO2, and used a similar insert, also in a slimline jewel case. In this case the CD contained both the “Radio Edit” and the “Album Version” of the song. In the USA the 5-inch promotional single was released in a card sleeve, and contained both the “Album Version” and the “Radio Edit”. It was released with full front and back printed covers. There was also a promotional CD released in Brazil, which contained just the “Album Version” in a generic card sleeve. There were promotional CDs in Japan, Argentina, Taiwan, and France, all of which were copies of the commercial CD with stickers, or painted to make it clear they were for promotion. The copies used for promotion in Taiwan were the UK pressing of the singles. Music by U2. Lyrics by Bono & The Edge. Recorded by Mark ‘Spike’ Stent and Howie B. Assisted by Rob Kirwan and Femio Hernandez. Mixed by Mark ‘Spike’ Stent. Assisted by Conal Markey. Decks and Loops: Howie B. Contains sample from “Fane” performed by Freeform and written by Simon Pike, courtesy of Skam Records. Music by U2. Lyrics by Bono & The Edge. Produced by Flood. Recorded by Mark ‘Spike’ Stent and Howie B. Assisted by Rob Kirwan and Femio Hernandez. Mixed by Mark ‘Spike’ Stent. Additional mixing by Howie B. Assisted by Conal Markey. Inspirational Decks and Loops: Howie B. Music by U2. Lyrics by Bono & The Edge. Recorded by Mark ‘Spike’ Stent and Howie B. Assisted by Rob Kirwan. Mixed by Flood. Assisted by Rob Kirwan. Keyboards: Des Broadbery. Music by U2. Lyrics by Bono & The Edge. Produced by Flood. Recorded by Mark ‘Spike’ Stent and Howie B. Assisted by Rob Kirwan and Fernio Hernandez. Mixed by Mark ‘Spike’ Stent. Assisted by Conal Markey. Decks and loops: Howie B. Remix produced by David Morales for Def Mix Productions. Additional production by David Morales and Satoshi Tomiie for Def Mix Productions. Remix engineer: Steven Barkan. Music by U2. Lyrics by Bono & The Edge. Produced by Flood. Recorded and Mixed by Howie B. Assisted by Conal Markey. Remixed by Howie B. Contains sample from “Fane” performed by Freeform and written by Simon Pike, courtesy of Skam Records. Music by U2. Lyrics by Bono & The Edge. Produced by Flood. Recorded by Mark ‘Spike’ Stent and Howie B. Assisted by Rob Kirwan and Femio Hernandez. Mixed by Mark ‘Spike’ Stent. Assisted by Conal Markey. Decks and Loops: Howie B. Remixed by Steve Osborne for 140dB. Remix engineer and programmer: Ben Hillier. Contains sample from “Fane” performed by Freeform and written by Simon Pike, courtesy of Skam Records. Music by U2. Lyrics by Bono & The Edge. Produced by Flood. Recorded by Mark ‘Spike’ Stent and Howie B. Assisted by Rob Kirwan and Femio Hernandez. Mixed by Mark ‘Spike’ Stent. Assisted by Conal Markey. Decks and Loops: Howie B. Remix produced by David Morales for Def Mix Productions. Additional production by David Morales and Satoshi Tomiie for Def Mix Productions. Remix Engineer: Steven Barkan. Contains sample from “Fane” performed by Freeform and written by Simon Pike, courtesy of Skam Records. Music by U2. Lyrics by Bono & The Edge. Produced by Flood. Recorded by Mark ‘Spike’ Stent and Howie B. Assisted by Rob Kirwan and Femio Hernandez. Mixed by Mark ‘Spike’ Stent. Assisted by Conal Markey. Decks and Loops: Howie B. Additional production and Remix by David Holmes. Remix Engineers: Jagz Kooner and Gary Burns. Contains sample from “Fane” performed by Freeform and written by Simon Pike, courtesy of Skam Records. Recorded at Hanover, Dublin, Windmill Lane Recording Studios, Dublin and South Beach Studios, Miami. Photography by Anton Corbijn. Design and Computer Treatments by ABA, Dublin.